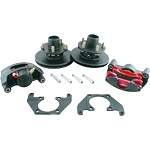 Shadow Trailer Parts Store offers Trailer Disc Brakes from all of the top manufacturers such as Kodiak, UFP (Unique Functional Products) and Titan Trailer Components. Trailer disc brakes can be yet another layer of safety and protection for you and your precious assets that are on a trailer or your vehicle. 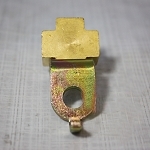 The extra stopping power that trailer disc brakes add in supplement with the vehicle's brakes can sometimes mean the difference between a near-miss and a tragic accident. 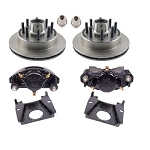 We carry the very best brands of trailer disc brakes, and we offer parts as well as full sets of varying sizes and types. You are sure to find the trailer disc brakes you want or need right here! Feel free to contact us if you need sound professional advice about the trailer disc brakes we carry that will be th best fit for you. We are always here to help and there is no such thing as a stupid question - except the one that isn't asked! 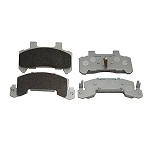 Calipers and Pads for Hydraulic and Trailer Disc Brakes. Free Shipping over $50. 10 inch Trailer Disc Brakes. Brands such as Kodiak, Titan, UFP and more. Free Shipping over $50. 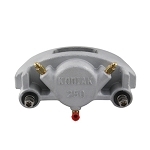 12 inch Trailer Disc Brakes by Kodiak, Titan, UFP and more. Free Shipping over $50. 13 inch Trailer Disc Brakes by Kodiak, Titan, UFP and more. Free Shipping over $50. 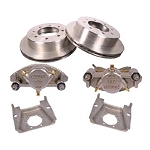 Trailer Disc Brake Kits by Kodiak, Titan, UFP and more. Free Shipping over $50. Trailer Disc Brake Rotors and Brackets. Free Shipping over $50. 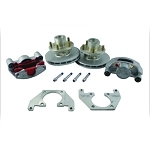 Swing-Away Disc Brake Kits for trailers, free shipping. Kodiak Disc Brakes and Accessories. Free Shipping over $50. Titan Disc Brake Kits, and Swing-Away Disc Brakes. Free Shipping over $50. UFP Disc Brake Kits, and Accessories. Free Shipping over $50. Solenoid Valves for Trailer Disc Brake Assemblies. Free Shipping over $50.